The assistance was a timely boost to Fiji’s prepara­tions for this important event – sup­port that would ensure the logistical arrangements for the meeting could be met at an international standard. Ministry of Economy Permanent Secretary, Makereta Konrote and High Commissioner of Australia to Fiji John Feakes during the signing of the agreement on April 5, 2019. Australia is providing AU$2.75 million (FJ$4.17 million) to the Fijian Gov­ernment to support the hosting of the 52nd Annual Meeting of the Board of Governors of the Asian Development Bank (ADB) in Nadi. Fiji will be the first Pacific island country to host the Annual Meeting from May 1 to 5. 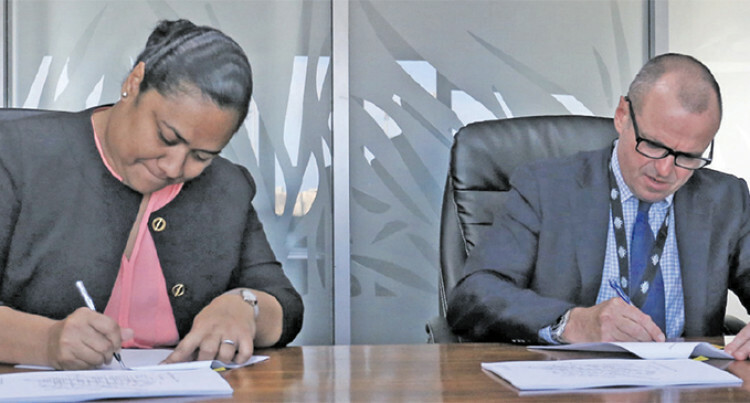 A direct funding agreement was signed past Friday between Min­istry of Economy, Permanent Sec­retary, Makereta Konrote, and the Australian High Commissioner to Fiji, John Feakes. Ms Konrote said the assistance was a timely boost to Fiji’s prepara­tions for this important event – sup­port that would ensure the logistical arrangements for the meeting could be met at an international standard. “The ADB Annual Meeting is go­ing be a unique experience for del­egates and we acknowledge Austral­ia’s generous support. Mr Feakes said the support would help the Government of Fiji meet the demands of hosting such a large and prestigious international meet­ing. “Australia is pleased to assist Fiji to host a successful ADB Annual Meeting. “The meeting, which is being held in the Pacific for the first time, again demonstrates Fiji’s leadership in the international and regional are­na. It is another first for Fiji”.